Umbria is a region of Central Italy, bordered by Tuscany to the west, the Marche to the east and Lazio to the south. This region is mostly hilly or mountainous. Its relief is dominated by the Apennines to the east — accounting for the highest point in the region at the summit of Monte Vettore on the border of the Marche (2476 m = 8123 ft) — and the Tiber valley basin, accounting for the lowest point at Attigliano (96 m = 315 ft). An elegant stone farmhouse, in the untouched heart of Valle Umbra, Villa Rosy is located in the midst of a nine hectare olive grove on the gentle hills of Mount Subasio. Only 3 km from Assisi, the estate enjoys splendid views over the valley with the towns of Perugia and Montefalco in the distance. In this rich sunny countryside, which is the cradle of great wines and excellent extra virgin olive oil, everything leads our guests to taste the joy of life whether it be laying in the shade of an ancient oak or in a romantic arbour, strolling around the villa enjoying the perfume of rosemary and lavender or gliding silently in the sky at the paragliding school 800m away from the villa. The original structure has been divided into two apartments furnished and equipped to a high standard with a mixture of modern and antique furniture: Mimosa and Magnolia. And the views over the plain below is astonishing. Sleeps 10. This delightful country house is set on the lower slopes of Mt Subasio, a regional park, in the area known as the green heart of Italy. 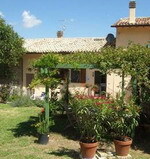 It is in a quiet rural setting, one of a group of four houses, with Italian country people as its neighbours. The Australian/English owners are sometimes in residence next door and are available to help with any local information you may need. The house has every comfort, with attractive modern furniture and a brand new kitchen. Set on two floors, the living room with TV, CD player, books etc and the separate kitchen are on the ground floor and the three bedrooms (two Queen-size double, one single) and bathroom on the lower ground floor. The front of the house looks out over the garden and from the back there are views over the wooded valley. This house probably suits five people best but there is a day bed on the inner balcony room for an additional person and a good-sized childs cot is also available. Towels, bed linen etc are included. Sleeps 5. Casa Merlo is part of the recently restored and reconstructed medieval borgo of Le Ginestre at Greppolieschieto. Le Ginestre lies within 100 hectares of oak forest near the Umbrian/Tuscan border which in turn is surrounded by forests and open farmland. Casa Merlo has beams and handmade antique 'cotto' flooring throughout and offers spacious living accommodation with a cosy romantic atmosphere, ideally suited to both family stays or couples looking for a romantic break. Le Ginestre is the ideal location to switch-off from the toils of everyday life and lose oneself in the tranquillity and beauty of the local countryside. The perfect location to relax and read, paint or just simply listen to the sounds of nature. For those with children it is an ideal base for the children to play and explore the countryside in safety. Sleeps 5. Luxury self catering apartment for 2/4 people in restored 300 year old stone farmhouse. Amazing views, sun terrace, olive groves. Originally a Casa Padronale, Villa Bastiola is situated on the hillside at Comunaglia, in the Upper Tiber Valley in Umbria on the border with Tuscany, and has stunning 360 degree views over the surrounding countryside and valleys. The first floor of the old farmhouse has been restored as an independent apartment retaining many of the original features including ancient chestnut and oak beams and terracotta flooring over three hundred years old, and a pietra serena fireplace and wardrobe. The apartment has two double bedrooms, both with en-suite bathrooms. Sleeps 6.